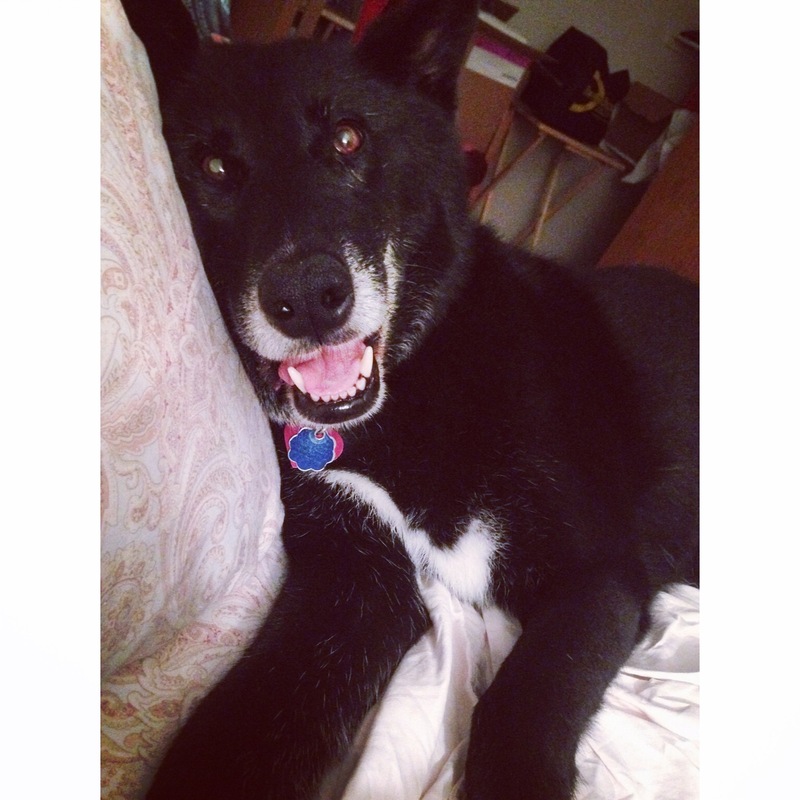 It’s no secret that I’m obsessed with my wolfdog. Well… for Bossey Boots, it’s not nearly as obvious as it is in my actual life, but if you take one look at my Instagram, you’ll see that it’s pretty much me, food, workout/nutrition posts, and my dog. Before I got my own pup, I owned a dog walking business. I’d experienced the semi-perks of having temporary dogs, especially at the dog park. But it’s a whole different game when the pup is your own. There’s this weird sense of pride in being able to brag about your dog to people you meet on your adventures. Shadow is friendly and loves just about everyone unless you’re a cat, a squirrel, or a rabbit (or that rude dude Husky at our last residence). Regardless, because Shadow’s so friendly, he makes us friends. All the time. Everywhere we go. Yes, you read that right. My dog gets me friends. Emma Stone just gets my whole life. A few weeks ago, we were just getting back from a night walk. He’s obedient and great about being off-leash, so I let him loose whenever safety allows. I unclipped him once we were through the door to our complex, and we headed up the stairs. He was a flight ahead, and I expected him to be waiting on the landing as usual, when I heard a male voice say, “Oh hey pup!” I trotted the rest of the way up to see Shadow wandering into the apartment down the hall. Two boys were headed out for the night, their door was open, and Shadow decided to introduce himself, and thereby, inadvertently introduced me. And hey, I’m not complaining. We make friends with other dog owners. Last week, we met a cute guy with a German Shorthair puppy just down the street from us, and the week before that, we met a 4-month-old Beagle pup and her owner tip-toeing through post-Halloween beer bottle wreckage on the sidewalk. PSA: College towns aren’t the safest place to have a pup, which makes me even more grateful that Shadow is in his older years. No chewing, no mischief, less curiosity. He makes life as a pet owner really easy. We meet people when we’re trail running or hiking. Last week, we picked up a new running buddy, who is also a perfect playmate for Shadow. Holly loves to be chased, and Shadow definitely loves to be the chaser. Sometimes we pick up buddies that love Shadow, but the feeling isn’t mutual, like the overly energetic Goldendoodle puppy we ran into on Monday. The employees at Java House love us. Well, they love Shadow. They like me because I have the dog. 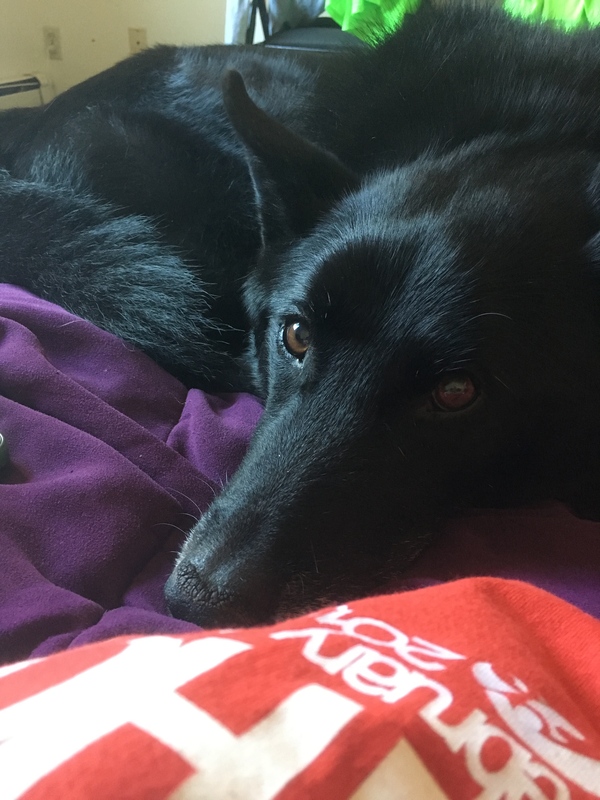 I’m really just “Shadow’s human,” a title I resigned myself to accepting way back in August when we could regularly be found on their patio, me working on a myriad of things, and him lounging, eating cookies, or crying for the two whole minutes I left him to go in for coffee. We’re working on his separation anxiety. Because we do so many things together, he takes it rather personally when he isn’t allowed to come with me every time I leave. Even if I’m just going down the hall to do laundry. We make friends virtually everywhere we go, and there are always one of two reactions: “OH MY GOD HE’S SO PRETTY HE LOOKS LIKE A WOLF!” or the exact opposite where people move to the other side of the sidewalk, afraid he’ll take off their arm when we pass by. He makes for an intimidating bodyguard, though if push came to shove, I’m not really sure what he’d do. One thing is for certain, though: He’s devoted to me, I adore him more than any other living thing on this planet, and I’ve got some pretty phenom humans in my life. It’s just that… Pack loyalty and unconditional love only a dog can provide is impossible to beat. So ya wanna meet new people? Get a good dog, have a fun personality, make all the friends. This plan gets two thumbs up. ← What’s the Over/Under on Getting Hired?